I’m a very lucky guy. I am a physicist, and I love to understand how things work. I am very curious. I love electricity, my favorite topic in physics. When I was four years old, we lived in a very old house, with a primitive electrical system. There were no power receptacles like today. Instead, there were sockets in the baseboard, like you have in a lamp. I was intrigued. Home alone, I unscrewed the adapter, which looked like the base of a light bulb, but with a power receptacle. I inserted a penny into the socket, and screwed the adapter back in place. The lights went out. My parents changed the fuse, but it kept blowing out. They called an electrician. He found the penny, and got the lights back on. I was a very lucky guy. The fuse worked. I was still alive, the house didn’t burn down. More importantly, my parents didn’t punish me; they must have been impressed by what I had done..
A few years later, Charles Gardener, a friend of my parents, gave me a children’s book, “Let’s Look Inside Your House,” by Herman and Nina Schneider. I was six. This book presented numerous experiments and explained how a fuse box worked. I did all the experiments in the book. My first summer job was at the Cambridge Electron Accelerator (C.E.A.). This was a circular ring of magnets which accelerated electrons. Who knew there was a particle accelerator in our backyard, just north of the Peabody Museum? First, if you want to accelerate these electrons (light, negative particles), you need to have a beam pipe. The beam pipe runs in a large circle and needs a really good vacuum so that the electrons survive thousands of turns around the accelerator. That needs vacuum pumps; at C.E.A. those were powered by a 5,000 volt power supply. My task on the first day on the job was to move that power supply without turning it off. I was curious. I reached below the power supply to see if anything was sticking out. Yes, the 5,000 volt connector was exposed, and I got a hold of it, and was instantly paralyzed. I could not move my arm. Luckily, it was the summer. I wore a short sleeved shirt, and my bare arm was welded to the power supply. Luckily for me, the machine techs knew what to do: they grabbed a 2x4 wood piece, and whacked my arm off the power supply. Notice: they did not turn off the power supply. I was a lucky guy, I am here to tell you about this and I still have my right arm. Lesson learned: be careful of high voltage, it can kill you. How to make electrons travel in a circle? Second physics lesson: how do you make electrons travel in a circular orbit? The answer is magnets. (Magnetic force is part of electromagnetism.) A circular synchrotron with a single beam pipe could have electrons rotating one way, say clockwise, and anti-electrons (positrons) circulating the other way, counter-clockwise. Remember that thought. Best summer job ever: Stanford Linear Accelerator Center. The best physics grad school, maybe in the world. Seven years, learned electricity, magic of particle detectors. Because of my politics, there were no job offers. I have to call my Stanford friend who says call George Trilling. Professor George Trilling, asked me if I knew how to make a photo-multiplier work? Understand trigger Electronics? Of course I did, that’s baby stuff. He instantly offered me the best job of my life. I’m a very lucky guy. I went to Berkeley in the summer of 1971. 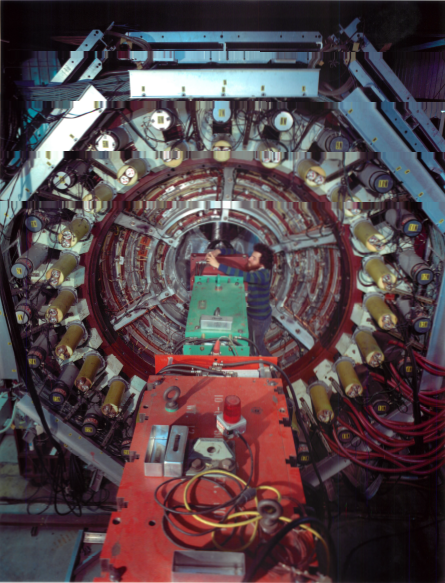 SLAC was building a Circular storage ring—a collider. SPEAR: describe a new kind of collision of electron vs. positron beams, head-on, but now with lots of energy. Electrons rotate clockwise, Positrons rotate counter clockwise inside a circular beam pipe, similar to the CEA. There are two points where the beams cross, and collisions can occur. Those two points sited big experiments. Combine electronics to select events, record them for later review, and display on a screen. Annihilations could produce a lot of interesting events (conservation of energy, momentum, quantum numbers). Our data collected through the summer of 1974 showed some possibly unexpected data—more than expected. Typical rates were a few annihilations per day. We began a run at beam energy around 3.0 GeV, ramp up slowly. Find a huge increase of events at 3,100 MeV; this was the J/Psi particle. I was on shift, we hit the jackpot, and the detector rang out like a slot machine in Vegas with 3 cherries on it. Many, many events in an hour. The next morning, my mentor Gerson Goldhaber, with Burt Richter, Willy Chinowsky, and a few other collaborators, wrote the paper that got Richter his Nobel Prize for the co-discovery of the J/psi particle: charmonium, a bound state of a charm quark and the anti-charm quark. A whole family. Two weeks later we discovered a second one, around 3,500 MeV. As part of this experiment, a team led by our collaborator Martin Perl found a new, heavy lepton (above the electron and the muon). Perl received his Nobel prize much later, in 1995. I was a lucky guy. I knew I would never experience another day like this one. I left experimental particle physics after this momentous experiment was over. With the discovery of the charm quark and the tau lepton, we filled in two of the seventeen slots of the standard model.